In a posting earlier this week I attempted to put some context around the triple that served as Matt Wieters’ first major league hit and mentioned that the Birds’ career leader for triples among catchers is Hank Severeid. Severeid played for the St. Louis Browns, the precursor to the modern Orioles, from 1915 to 1925 and hit 36 triples during that time. This week’s Flashback Friday revisits the career of the catcher known by some writers as “the detective of the diamond” for his cerebal play behind the plate. Severeid’s primary claim to fame is that he caught no-hitters on successive days, May 5 and 6, 1917, during his third season with the Browns. Ernie Koob tossed a no-hitter in a 1-0 win against the Chicago White Sox; Bob Groom matched the feat the following day in the second game of a doubleheader. Severeid also caught one game for the Washington Senators in the 1925 World Series and all seven games for the New York Yankees in 1926. During his career, Severeid played for the Cincinnati Reds (1911-13), Browns, Senators (1925-26) and Yankees (1926). His batting average topped .300 a dozen times in 28 seasons, peaking at .324 in 1921. Late in his career, at age 46, Severeid joined Galveston in the Texas League and caught a doubleheader on the final day of the 1937 season. He also managed in the minors, worked in the Cincinnati Reds’ farm system, and served as a Cubs and Red Sox scout. In addition to leading all Orioles catchers in triples, Severeid is the franchise’s career leader in at-bats per strikeout (27.8). In his first game with the Browns on April 17, 1915, Severeid hit his first major league home run, a three-run shot off of the White Sox’s Hi Jasper, as part of a 4-3 Browns victory. 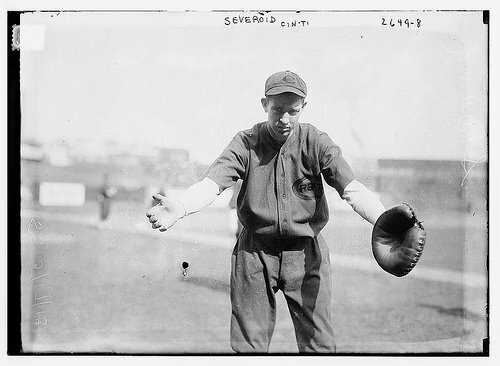 Known as a solid backstop, Severeid caught a record 2,603 games in the majors and minors and appeared in more than 100 games for the Browns every year between 1916 and 1924, except 1918 when he was in the military. He was the leader for fielding percentage among catchers in 1919, 1923, and 1924, and his .993 fielding percentage once served as the major league record for a season. Despite his durability, Severeid was knocked unconscious during a game on July 18, 1916, when Boston’s Babe Ruth bowled him over at the plate. However, the catcher was tough, and he knew it. Severeid once severed an artery during a home plate collision when the base runner spiked him above the knee. Severeid watched the doctor tie the two ends of the severed artery together and returned to action a week later. Cobb returned to the plate, and Root struck him out. In addition to catching consecutive no-hitters, Severeid once ended a perfect game when he walked with two outs in the eighth inning of a 4-0 Browns loss to the Red Sox on Aug. 30, 1916. Hubert “Dutch” Leonard earned a no-hitter as consolation. Severeid died in 1968 at the age of 77. The Iowa native is a member of the Des Moines Register’s Iowa Sports Hall of Fame.